I have another pattern on the Accuquilt website. Click Here for Pattern It is called Star Illusion! It really is the simplest pattern ever. 1930's reproduction fabric was used to make this quilt. It was cut using the GO! Qube 8" and GO! Qube 8" companion set. It only requires two dies and goes together fast. The hardest part of this quilt is organizing the rows to get the star pattern. I laid out the blocks and pieced them in four patches and assigning a row letter and number to each. 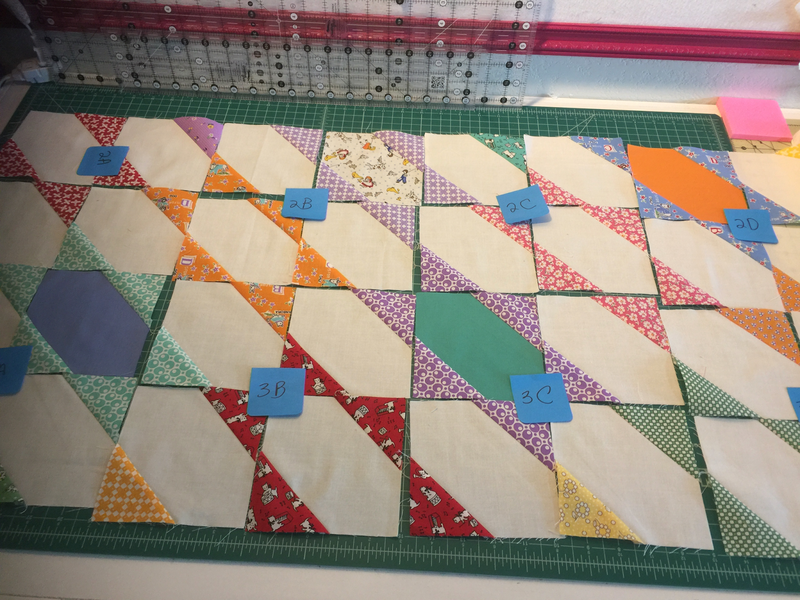 I pinned the HST to each middle piece and stacked them in 4 patches with a label. 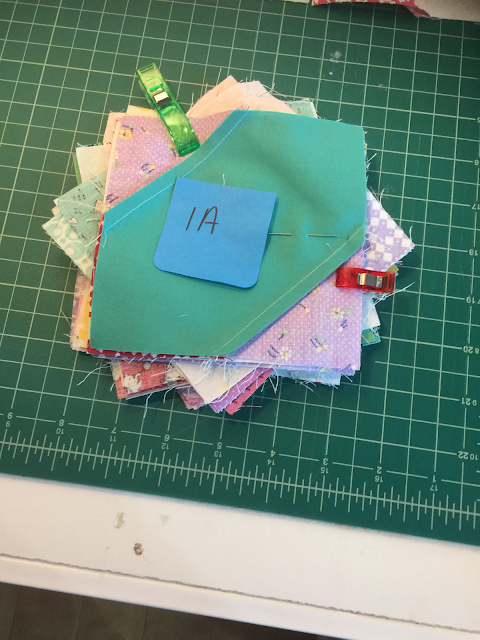 I chain pieced each 4 patch then stacked them with the label. After pressing the 4 patches I then stacked the four patch together while pinning the side that need to be sewed. I clipped the four patch together then stacked all the four patches in the row, clipping the whole row with a bigger clip. I then chain sewed the four patch, making sure I kept them organized. Piece the row of 4 patches together before moving to the next row. 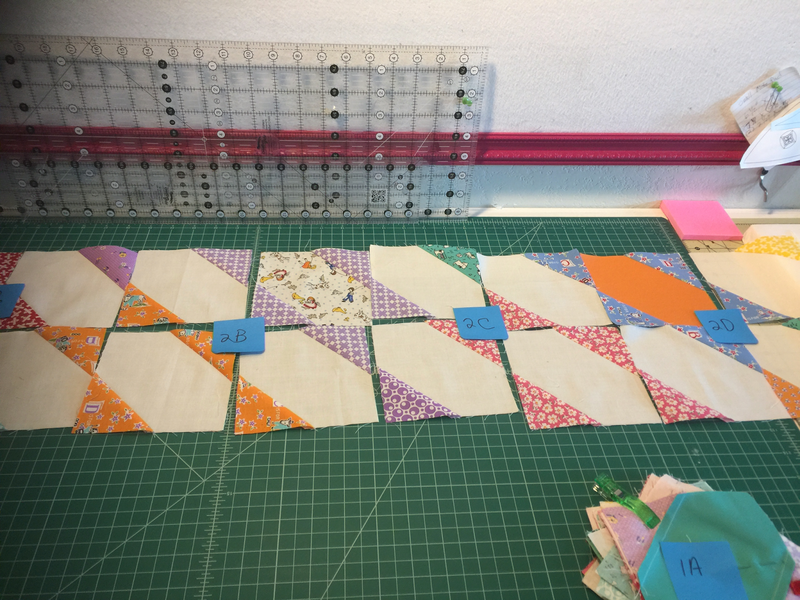 Use the pieced row to lay out the next row so that you have them creating the star pattern. 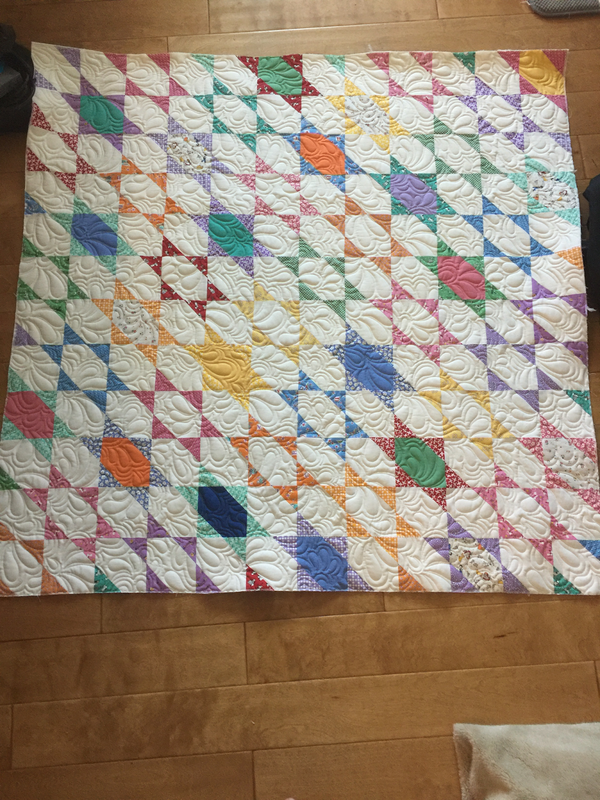 The quilt I made for Accuquilt doesn't have any borders. But you could easily add borders to make it bigger or add more rows. I am currently working on another one that I have added rows to make it longer and I will add borders to the quilt top. I do have another quilt I created for Accuquilt but they have not posted it yet. I will added it to the blog once it is posted. 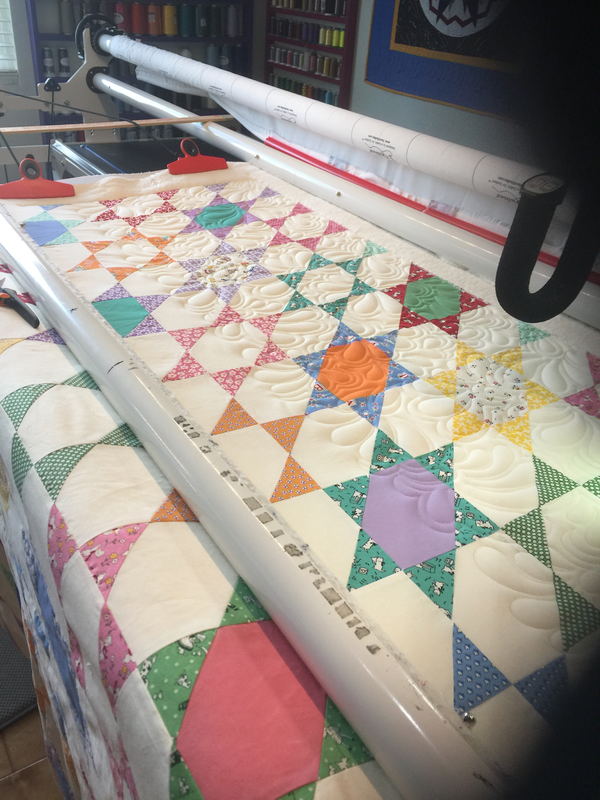 The quilt was quilted on my Handi Quilter longarm. I used a digitized pattern of feathers on the quilt. 2 layers of 80/20 Hobbs batting was used. Kern County Fair and Cowboy Quilts! Updated! The fair is coming to Bakersfield next week. I thought I would honor the fair by talking about my cowboy boot quilt I made for my sister-in-law last year. 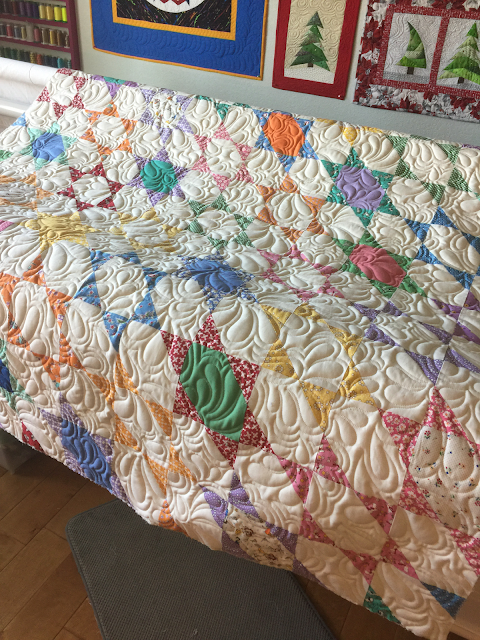 I made this quilt before I bought my Handi Quilter longarm. 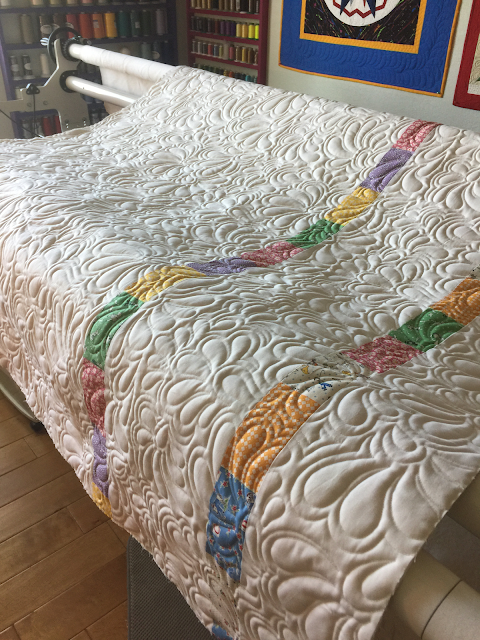 The quilt was quilted on my Bernina. I marked the quilt before quilting and also did some free motion quilting on it. I wish I would of took a picture of the setup I had for the Bernina. I had the sewing machine in our great room on a small fold up table. We bought a Styrofoam insulation board and cut it up to fit around the sewing machine to make a wide flat surface. The styrofoam was an inch and a half thick I believe and we doubled it up to bring it to the surface of the sewing machine. It worked out pretty well. I still wouldn't go back to it now that I have a longarm. 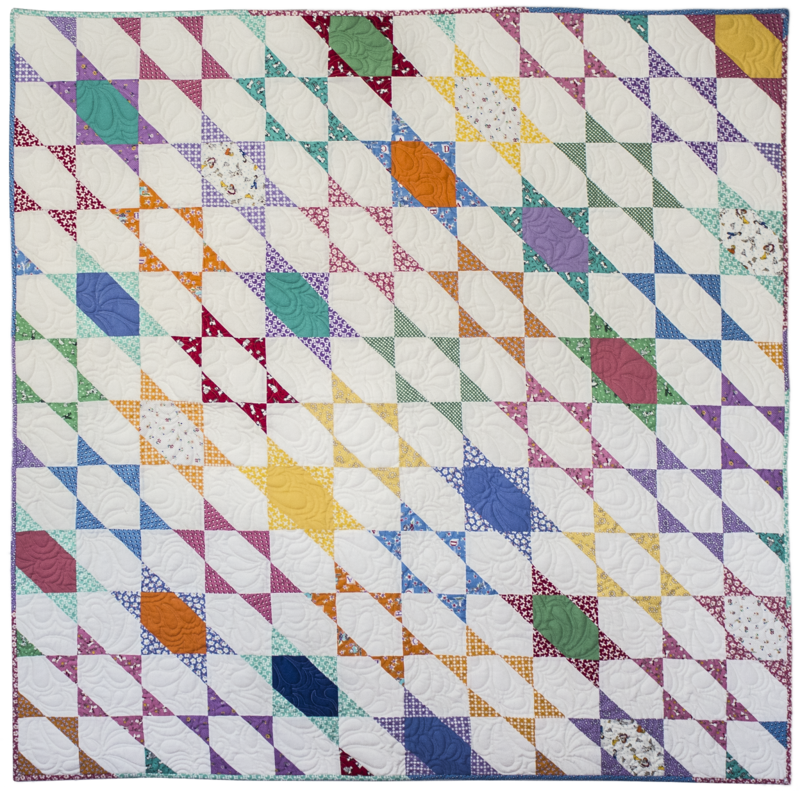 I thought I would start the day off offering some of my free quilt patterns on my blog. Most of these are available on Craftsy but I know not everyone has an account at Craftsy. First up is a quilt I made for my Grandsons. I call it "Which way is up!" It is made with large flying geese. Click for free PDF Pattern. This quilt would look great in a variety of fabric. I colored it in fabric from Laundry Basket Quilts and I think it would look fantastic with this color way! Next is my "Rose Pineapple Quilt". I love this little quilt. The pattern does not include the appliqué you see in the picture. It only has the paper piecing blocks. Click for Rose Pineapple Pattern.